Heat oven to 450°F. Unroll pie crusts on work surface. With 2 1/2-inch plain or scalloped edge round cutter, cut crusts into 36 rounds. Fit rounds into ungreased miniature muffin cups, pressing in gently. Generously prick crusts with fork. Bake 7 to 9 minutes or until light golden brown. Remove tartlet shells from muffin cups; place on cooling racks. Cool 10 minutes. Meanwhile, cut pomegranate in half; remove seeds. Set aside. In 2-quart saucepan, stir pudding mix and whipping cream with wire whisk until blended. Cook over medium heat about 5 minutes or until mixture comes to a boil, stirring constantly. Remove from heat; stir in rum. Immediately spoon about 2 rounded teaspoons filling into each tartlet shell. Top each with about 1 teaspoon pomegranate seeds. Cover loosely; refrigerate at least 1 hour or until serving time. 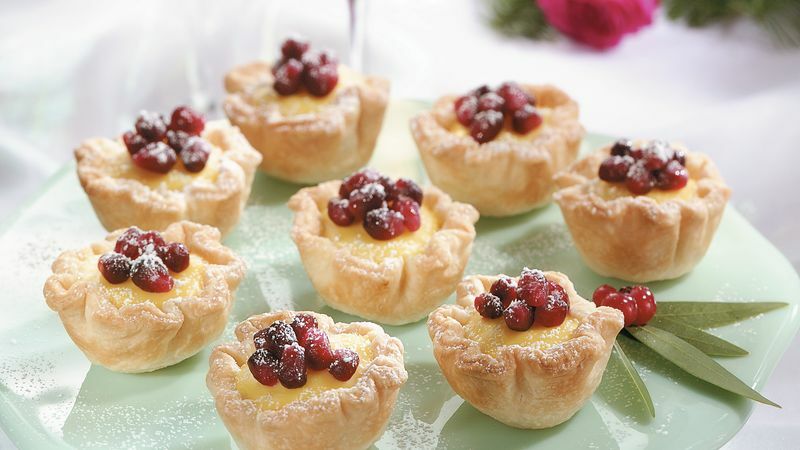 Just before serving, sprinkle tartlets with powdered sugar. Gently press rounds, pleating slightly to fit, into mini muffin cups. To remove the seeds from a pomegranate, you will need a sharp knife and bowl of cold water. Score the pomegranate skin from top to bottom about 5 times, evenly spaced. Hold the pomegranate underwater in the bowl, and pull it apart into sections. Remove the seeds with your fingers or a small spoon while holding it underwater. The seeds will sink to the bottom, and the skin and membrane will float to the top. Remove the membrane with your fingers, and drain the seeds in a strainer.